Three Sisters are a cluster of volcanoes, composed of North Sister, Middle Sister, and South Sister. They are located approximately 25 km SW of Sisters, OR. North Sister is considered extinct, and Middle Sister has not erupted for 14,000 years. South Sister is the youngest volcano, and erupted explosively about 2,000 years ago. It has erupted lavas ranging from basaltic andesite through rhyolite. In 2001, uplift of almost 30 cm was detected in an area 5 km W of South Sister. This uplift was accompanied by a seismic swarm in 2004, raising concern of renewed activity. By 2007, uplift had slowed and seismic activity returned to background levels. 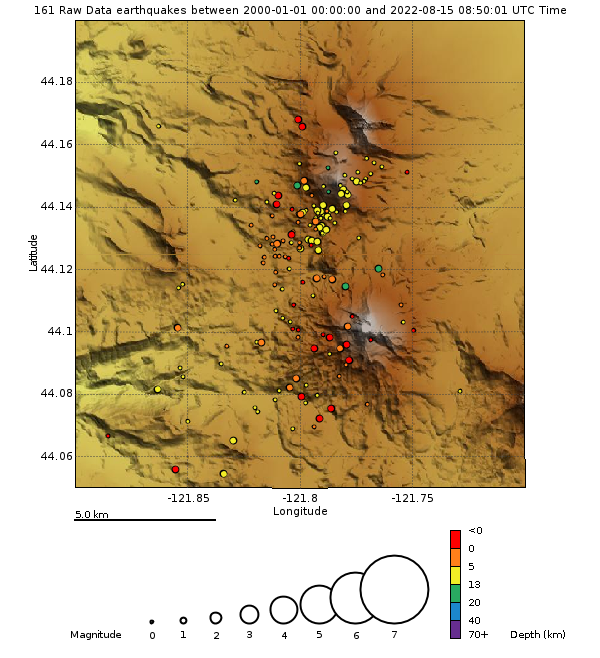 The Cascades Volcano Observatory, University of Oregon, and the PNSN cooperatively operate 10 seismometers on or near Three Sisters. On average, we locate 0 to 3 earthquakes within 10 km of the volcano each year. Before about 2001 the Three Sisters region was very poorly monitored for earthquakes. The detection capability was probably no better than Magnitude 2.0 or greater. After InSAR imaging in 2001 detected uplift occurring seismographs started to be installed in the remote wilderness area to the west of the main volcanoes improving detection capabilities. Very few earthquakes have been recorded here; an average of less than 2 per month and over half of those were in a swarm that took place in the spring of 2004. Thus, during many months no earthquakes are located in the Three Sisters area. Below you will find an epicenter map, time-depth plot and seismicity plot for the Three Sisters area for the time since 2000. These show the typical or background levels of earthquakes under the volcano. Since 2001 there are a reasonable number of seismograph stations located on in the area such that the regional seismic network can reliably detect and locate earthquakes of magnitdue 0.8 and larger in this area. Even smaller earthquakes can sometimes be detected and located though many also are missed. Below is a time-depth plot of events located directly under Mount Baker since 2000. This plot is updated weekly... unless, of course unusual activity takes place that suggests a different time sequence is needed to better interpret that activity. Note the only significant seismicity was the fairly intense swarm in early 2004 during the period of uplift as indicated by iSar and GPS data. Here is a seismicity plot that shows the number of located earthquakes per week (black spikes) and the cumulative number of earthquakes over time (red). This can point out periods when more events were located in a swarm such as the significant bursts of events in early 2003.